Zyga. Artists draw on air to create 3D illustrations. Online magazine PHYSORG.com, 2007. (pdf) (bibtex: Zyga-2007-ADA). Paul Grimaldi. Investing in Science. Providence Journal, March 11 2006. (pdf) (bibtex: Grimaldi-2006-ISC). President�s Information Technology Advisory Committee. Computational Science: Ensuring America�s Competitiveness. Report to the President, June 2005. (pdf) (bibtex: Pitac-2005-CSE). Stu Woo. Millions of federal dollars fund University research and construction. Brown Daily Herald, 9/28/05, 2005. (pdf) (bibtex: Woo-2005-MFD). Shirle Gottlieb. Putting Byte in their Creativity. 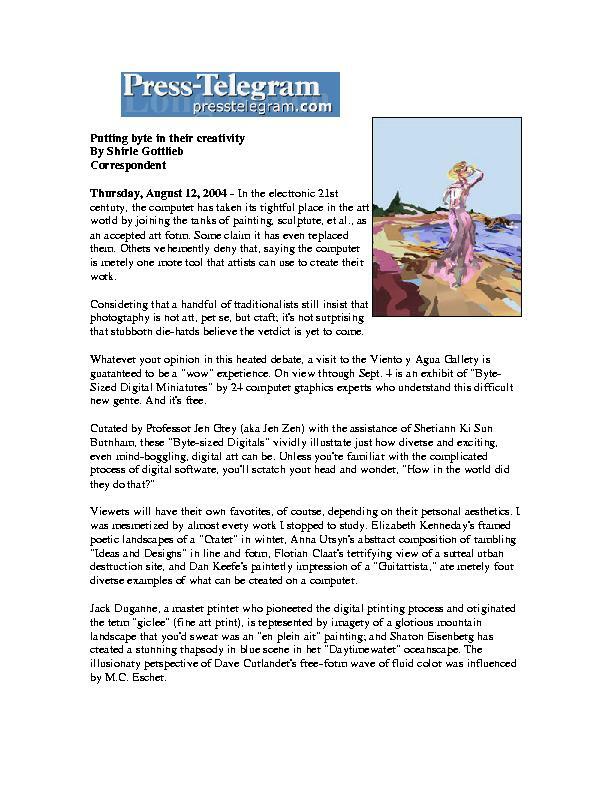 Long Beach Press-Telegram, August 12 2004. (pdf) (bibtex: Gottlieb-2004-PBC). Bill Van Siclen. 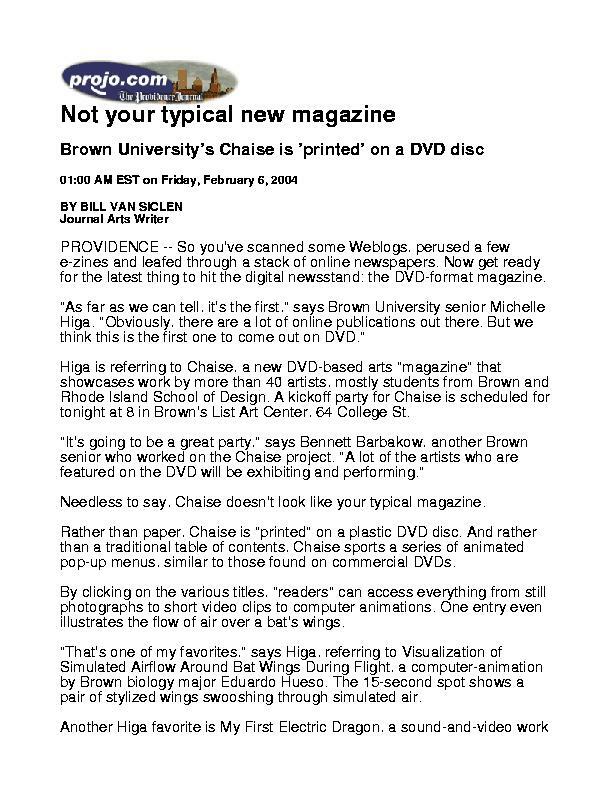 Not your typical new magazine: Brown University s Chaise is printed on a DVD disc. Providence Journal Arts Section, February 2004. (pdf) (bibtex: Siclen-2004-NYT). Colin Ware, Don House, David H. Laidlaw, and Jeffrey Proehl. Nugget for NSF: ITR Collaborative: Perceptual Optimization for Data Visualization. Submitted to NSF, January 2004. (pdf) (bibtex: Ware-2004-NUG). George Street Journal. Wriston Fellowships, Faculty Teaching Award winners. Goerge Street Journal, 27(25a), April 2003. (pdf) (bibtex: George-2003-WFF). Elizabeth Miller. Brown-RISD course unites two disciplines, two institutions. George Street Journal, 27, November 2002. (pdf) (bibtex: Miller-2002-BRC).